If you love playing slots games with a twist, try out community jackpot today for your chance to spin a massive win. Enjoy! If you’re on the lookout for a more unique slots gaming experience, then Everybody’s Jackpot from Playtech might be exactly what you’ve been searching for. 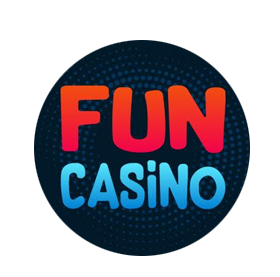 The game is linked up with a community jackpot, which in this case means that if you want to be in with a chance of winning the jackpot, you need to have wagered a certain amount. If you manage to win the jackpot, 70% of it will go to you, and the remaining 30% will go to all other qualifying players – so there’s plenty of reason to celebrate. 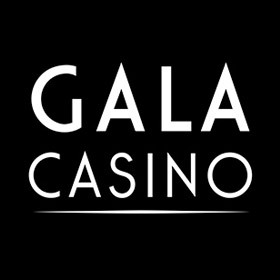 Designed like a TV gameshow, the game begins with a video introduction showing the two gameshow hosts welcoming the audience and introducing them to all the hundreds of members who have been able to make big wins on the game in the past. We are then taken to the reels, which actually make up the shape of a 9×9 grid, with 8 Pay-Lines across it. Next to the grid is one of the gameshow presenters standing under the current jackpot, which increases as more and more people wager on the game. Amongst the icons on the reels you can find watches, jewellery and even just slabs of gold, as well as the two presenters. To play Everybody’s Jackpot, first of all you need to set your wager. This is quite simple, as all you are setting is your coin size – there is no option to edit bet levels or pay lines or anything else. Simply use the + and – toggles to set your line bet, which can be a maximum of £1 and a minimum of 1p. Your line bet will be multiplied across your 8 pay lines, meaning that the highest bet per spin is £8 and the lowest is 8p. 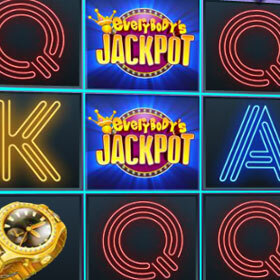 The main bonus feature in Everybody’s Jackpot is the Free Spins round. 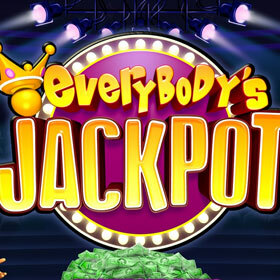 This is activated when three or more Scatter symbols, represented by the Everybody’s Jackpot logo, appear on the reels, automatically granting the player with 12 free spins. These games can be retriggered instantly. However, getting as little as two scatter icons will automatically grant you even bigger wins. 2 Scatters will get you a 1x win, 3 will get you a 3x win, 4 will get you 10x and 5 will grand you as many as 25x your win. Your wins and multipliers just keep getting bigger and bigger, and if you’re able to hit 9 Free Spins symbols across the grid, then you will get a 200x pay-out. As well as the scatter symbol, there is of course the Wild Symbol, which is a green spiral with the word “Wild” written on it. As with most slots games, the wild substitutes for all other symbols apart from the Scatter. This means that you can pick up plenty of extra wins just with this one symbol, bringing you ever closer to that amazing progressive jackpot.